The GT Powerboard is truly a power packed beast, with excellent traction, and low profile Kenda tires; are pneumatic for total and low centred gravity which can be ridden on the harshest of terrains including rocks and sand! With the fastest acceleration and powered torque, more than any other e-board today, Glide’s GT offers state of the art support, with European grade material. It also has a flexible deck, with a rise at the front for complete safety under extreme acceleration or braking! The board also has a crazy pick up speed, going from 0-23 MPH in 5 seconds! 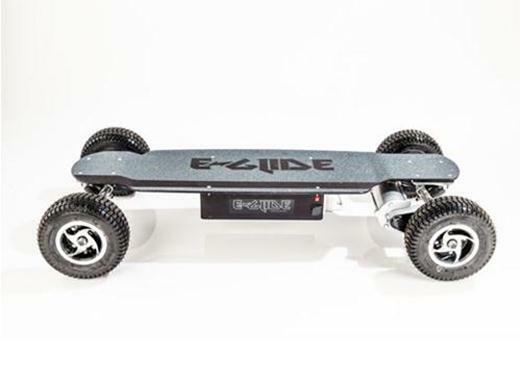 Is Glide GT Powerboard Safe? How Cost Effective Is Glide Gt Powerboard? The Glide GT Powerboard truly lives up to its name. It has an industrial grade Aluminum deck, which is 7.5 inches off the ground, providing excellent suspension for a smooth ride. The deck flexes, and has an upper risen platform for safety while riding downhill. The deck has high clearance, with the motors well away from the ground. The wheels are 9 inch Kendas grade tires, bulky and powerful by the looks, on a 17-inch base, which tread on just about any material. They are skid free, vibration and shock absorbent. It has an oversize drive belt, which is soundless, maintenance free and transmits the required power to all parts as needed. The whole board weighs 50-75 pounds, depending on which batteries are used. The grip tape spans the entire area of the deck, and the design is quite futuristic! The GT comes is incorporated with 12 volts, 12-amp BB Battery EB Series Cells, which can be paired with lithium batteries from H2A power. It has controlled rotations per minute, with A Grade braking. 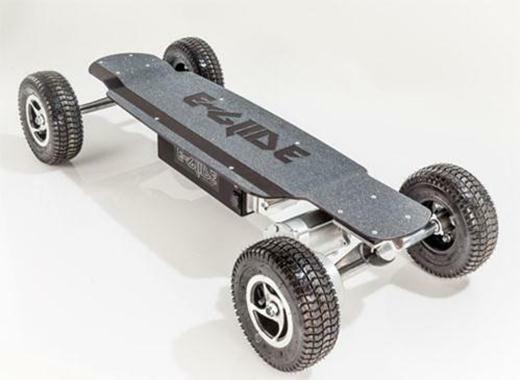 The board gives a range of about 15 to 22 miles, and takes about 4 hours to completely charged. It gives about 200 Watts, and can take up to 240lbs in weight. The GT is known for its ability to give the fastest speed as of today in the e-board range, adding to its torque. It also has an incline rate of 14 degrees, meaning that you can go uphill effortlessly, with no significant loss in acceleration or power! The testament to this, is the fact that one can go from zero to 23 MPH in a matter of five seconds! Equipped with waterproof technology, the GT board was engineered for ‘power, incorporating safety’. It can travel over grit and stones, sand and even hard based concrete, with suspension that can make every terrain feel like you’re riding over marble! It has a quarter inch drop deck, which helps with bracing for fast acceleration and sudden brakes. All the parts are replaceable, and of excellent quality, made from local stores, and thus are reliable. Equipped with pneumonic tires, that is air filled, it helps maintain stability while riding on rough patches. It comes with a wire remote, which has the advantage of not losing signal or interference issues, or when you hit a sudden brake where it may accidentally fall off. Launched at $1269, the GT is extremely cost effective, owing to the high-quality features it exhibits. The power board may be heavy, but it is one of the only cost effective ‘off-road’ boards, suited for riders who like a challenge. It has excellent tires, with off the charts suspension and self-balance. The Powerboard gives maximum speed of all the boards available today, and the highest torque. It supports 25% incline, which many other boards do not have. The whole shipment consists of the board, the remote, the charger, and aa user manual. Most boards in this range do not offer all terrain support, nor do they have such at such a high velocity.